On March 16th, AFLCR’s Lise Veronneau (far left) helped welcome the Consul General of Canada, David Alward (right of Gov. 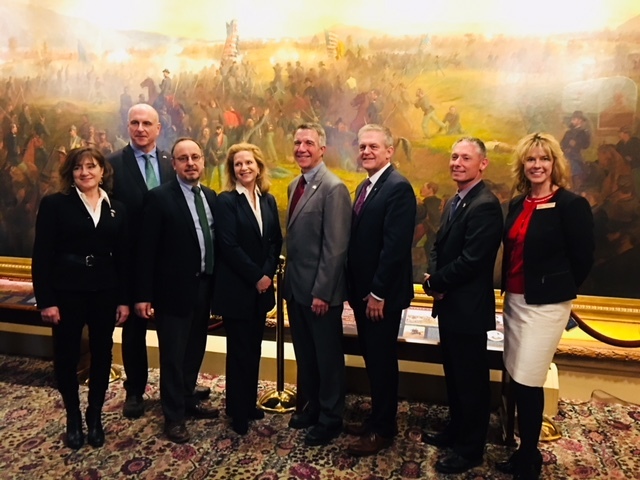 Phil Scott), Consul General of France, Valéry Fréland and Québec Delegate to New England, Marie-Claude Francoeur (to his left) for a reception and flag-raising ceremony in Montpelier. The annual raising of the Francophonie Flag was held exceptionally at the State House to include the Governor, the City of Montpelier, and by extension the entire State. Every March, French speakers and franocphiles celebrate the world-wide success of the French language and the democratic ideals it upholds during Francophony Month. The Alliance especially wishes to thank Ernie Pomerleau for having made the reception and gathering possible at the Capitol this year.